When operating a watercraft in Maryland, you are required to have at least one wearable Type I, II, III or V PFD for each person on board, regardless of the length of the vessel. All PFDs must be Coast Guard approved, in good and serviceable condition, readily available and appropriately sized for the intended wearer. In addition, you must also have at least one U.S. Coast Guard approved Type IV PFD, either a ring buoy or seat cushion, on recreational boats greater than 16 feet in length. Under Maryland law, you must also comply with the following PFD requirements. Persons being towed behind a vessel in any manner must wear a U.S. Coast Guard approved Type I, II, III or V PFD. A person being towed behind a vessel is considered to be on board. All PWC occupants must wear a PFD while underway. Inflatable PFDs are not recommended for children nor are they recommended for use during high impact sports such as water skiing or operating a PWC. Life jackets are required on non-motorized vessels, such as canoes, kayaks, standup paddle boards and any other device capable of being used as a means of transportation on water or ice. All children under the age of 13 must wear a PFD at all times while underway on a vessel less than 21 feet in length, unless the child is below deck or in an enclosed cabin, or the vessel is moored or anchored. A grab handle to ensure the child can be readily lifted out from the water. A boater with a blood alcohol content of .08% or more shall be presumed to be under the influence of alcohol. However, if a person has consumed alcohol, drugs or a mixture of both to an extent at which they may be deemed impaired, they may still be found guilty of operating under the influence. Boating Under the Influence (BUI) is a serious offense in the state of Maryland. If a boater is found guilty of BUI, they may face up to one year in jail as well as the possibility of fines of up to $1,000. These penalties will be doubled upon a second BUI conviction and tripled upon a third conviction. Under Maryland law, any person found to be in violation of certain boating law is required to successfully complete a boating safety education course, regardless of the violator's age. Those convicted of careless or negligent operation, or operating under the influence of alcohol or drugs, are required to take and pass a boating safety education course. Any person convicted of 2 violations within a year regarding vessel operation or required safety equipment must take and pass a boating safety education course. The Maryland Department of Natural Resources (MDNR) regulates the state boating laws in Maryland. All motorized watercraft, including those powered with gasoline, diesel and electric motors, that are principally operated on Maryland waters must be registered and issued a Maryland Certificate of Number, or Registration, by the Department of Natural Resources, Licensing and Registration Service Center. A vessel that is solely used for racing and holds a valid racing number. All vessels that are required to be registered must first obtain a certificate of title. Applications can be made to the Maryland Department of Natural Resources. The MDNR must also be notified within 15 days if the vessel is stolen, destroyed or abandoned. The Certificate is valid for two years and expires on December 31st of the second year. All vessels required to be registered are also required to be titled. The boat title must first be obtained by the MDNR before the Certificate of Number can be issued. 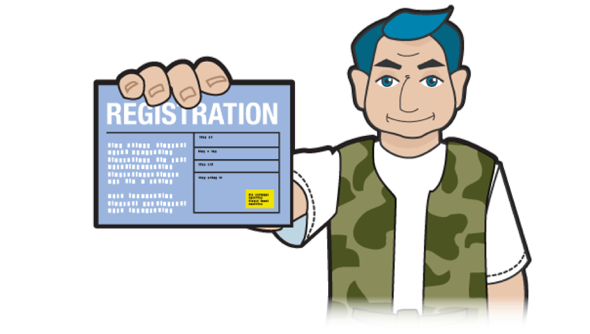 Upon registering your boat, you will receive a Certificate of Number (registration), and a registration decal. Both the certificate and registration decal are valid for 2 years. The decal must be displayed on the forward half of the vessel along with the vessel number. Personal watercraft are also required to display the certificate's number and registration decals. Make sure your watercraft is properly marked and documented and always keep your papers in a safe place on board the vessel. Lack of the correct documentation may result in delays and fines. *Vessels 16 feet or less in length, and powered by a motor of 7 ½ horsepower or less are exempt from this fee. Non-native aquatic species, plants, fish and animals are invading Maryland’s waters. Zebra mussels, didymo and rusty crayfish are examples of nuisance species that can be accidentally transported by recreational boaters when caught in propellers, intakes or attached to hulls. These pests can increase dramatically under the right conditions, displacing native species, clogging waterways, and impacting navigation and recreation. Once introduced, they are nearly impossible to eliminate. Report new or existing infestation of non-native aquatic species to the Department of Natural Resources. Personal watercraft are very powerful for their small size and demand the same respect as any size boat. That means PWC operators must follow the same rules and regulations as powerboat operators, including registering the watercraft with the state and carrying a B-1 fire extinguisher on board. There are also some additional requirements for operating a PWC in Maryland. 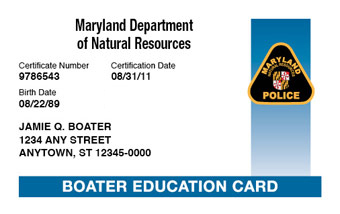 Anyone born after July 1, 1972 may NOT operate a motorized vessel, including personal watercraft, unless they have obtained a certificate of boating safety education approved by the Maryland Department of Natural Resources. PWC operators must be at least 16 years of age and possess a boating safety certificate. The operator and all passengers of a PWC must wear a U.S. Coast Guard approved Type I, II, III, or V PFD at ALL times. A PWC must be operated at a speed no greater than 6 knots (6.9 mph), when within 100 feet of another PWC, pier, pilings, bridge structure, abutment, or people in the water. All PWC must be equipped with a kill switch/cut-off switch. A PWC may NOT be operated in a careless or negligent manner, such as splashing, racing, or intentionally throwing off a passenger. When towing someone on a tube or on water skis, there must be capacity on the PWC to accommodate the operator, the observer and all persons being towed. When operating on Maryland’s coastal waters, PWCs may not come within 300 feet of persons fishing or in the water. A person may not operate or give permission to operate a PWC in excess of idle speed in any waters of the State less than 18 inches in depth, except when required to maintain speed in a crossing or overtaking situation. All PWCs operated in Maryland waterways and registered in the state of Maryland must have a DNR-approved PWC regulations sticker that is properly affixed to the PWC. There are additional restrictions for PWC operation on Deep Creek Lake. PWC are not permitted to be operated between 11 AM and 4 PM on the Saturday, Sunday, and holiday of Memorial Day Weekend and Saturdays, Sundays and State Holidays from July 1st through Labor Day. For more information on Deep Creek Lake regulations, refer to the Deep Creek Lake Boating Fact Sheet.